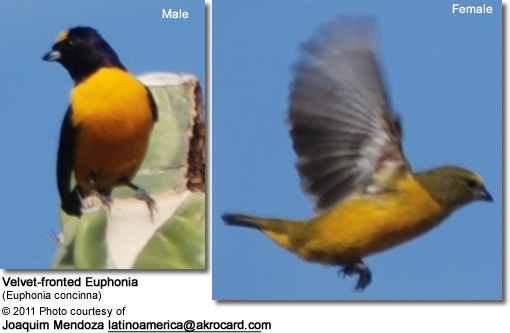 The Velvet-fronted Euphonias (Euphonia concinna) are endemic to west central Colombia in South America, where they are found in the upper Magdalena Valley from northern Tolima (Honda) and adjacent Cundinamarca south to southwestern Huila (La Plata). One record exists from middle Cauca Valley in western Colombia. 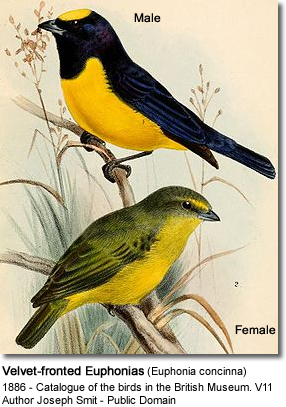 They inhabit subtropical or tropical dry forests and heavily degraded former forests.